Despite the suggestion of this present age, we are not in this world for ourselves alone. Our paths cross times, destinies, and people for a purpose. Our lives are meant to connect as building blocks upon the foundation of our Lord Jesus Christ to help bring about change in the world of individuals we meet and pray for and love with the heart of Christ. There is a “one another concept” that is richly expressed in God’s Word time and again. One verse tells us, “Wherefore comfort yourselves together, and edify one another, even as also ye do,” (1 Thessalonians 5:11). Another verse says, “…by love serve one another,” (Galatians 5:13). And yet, another still says, “Bear ye one another’s burdens, and so fulfill the law of Christ,” (Galatians 6:2). When we are thinking along the lines of ministering to people, it will only happen when we consider one another. It only happens when we step out of self for a moment, take our eyes off us, and see what another may be going through, and taking the time to step into their world for a minute to edify, serve, or help that one to bear something they need help with at the moment. Serving people is reaching into their world where their need is pleading for help. Sometimes that need is physical for things such as food or warmth, but at other times it’s a hug or a buddy saying, “I’m with you through this.” All of it is driven by concern about what someone else is going through. It’s not sitting in the seat of judgment over circumstance but it’s viewing them with the same compassionate eyes that caused Jesus to care about people the way He did. This kind of compassion toward others causes movement. One can’t see the struggle and not want to help with the need. It’s recognizing, Lord, I may not be able to help everybody in everything, but for this need, I can stretch out my hand, my heart, and my time to care about another soul. From the time of the creation of humanity, the “one another concept” has been in play. God designed another being in the form of Eve to help compliment Adam so that he wouldn’t have to do life alone (see Genesis 2:18-22). They were designed for relationship that offers support physically, emotionally, and spiritually to one another. This idea can most certainly be applied to relationships with our friends, people on our jobs or we come across during the day, acquaintances and so on. It’s hands and hearts of love designed for the betterment of humankind to meet the needs of one another wherever they are. The “one another concept” isn’t just a good idea. It’s a life choice that raises awareness of simply being there for people when people need you the most. In other words, put people on your radar and become alert to any distress signals or troubles that might be registering for attention. Some people may not know how to ask for help or feel completely uncomfortable with the idea, but in our awareness, when we notice those signals and answer the call, we can make a positive difference in that life that may have felt like it was going under all alone. After all, if it hasn’t happened already, and even if it did, there may still come a time when we need that same support system that compels another to be willing to put us and our needs ahead of their personal feelings, advancement, and/or pleasure. We don’t have to fit in with the self-serving nature of our modern culture. Especially, if we remember that Christ deliberately put all our needs ahead of His own when He went to the cross in our place. Love is what turned his attention off Himself and onto us. What more can we do but make the same effort to reach another with the same love and help that was so freely given to us? Is there another that needs you today? Watch those you come into contact with during the day. Are there ways you can brighten someone’s day? Can you offer water or bread, in Jesus’ name, to one who has a need to be filled? Can someone else use a word of hope and encouragement that guides them to see more than what they are facing now? Can another just have your listening ear and understanding so they can unload a great weight they have been carrying much too long? Touching needs where they are is only made possible when we get involved in the “one another concept”; when we allow God to use us, and our big or small offerings of help, to plant seeds of love in the life of one who may really need it today. 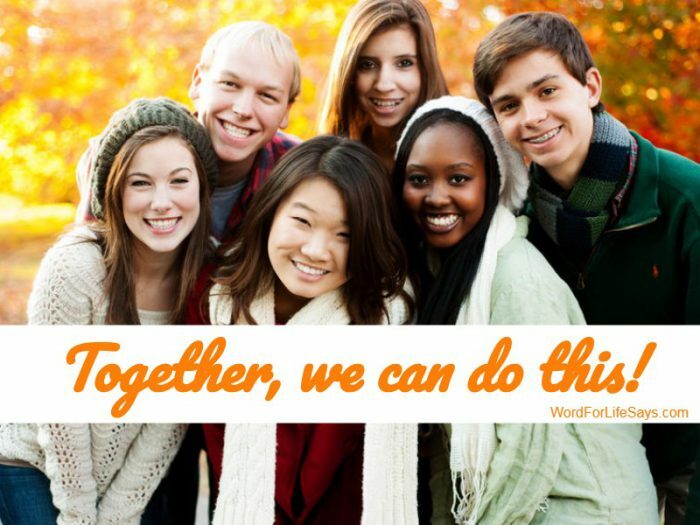 Together, we can do this! Pingback: “Faithful Disciples” Sunday School Lesson Summary and Activities, Acts 9:36-42 | Word For Life Says . . .